In John Paizs' 1986 film Crime Wave, struggling writer Stephen Penny's room is adorned with movie posters for classic American crime movies like Stolen Face, Hell's Island and Outside the Law. 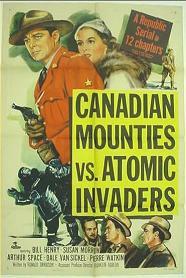 But there, tacked against a wall in the back a poster brazenly proclaims Canadian Mounties vs. Atomic Invaders. Although not actually made in Canada, this 1953 Republic serial was probably the most outlandish example of Hollywood's interpretation of Canada. Paizs' nod to the Mountie film is perhaps his acknowledgment of the strange role that the figure of the Mountie has played in North American film history. The Mounties were common screen heros for fifty years, eventually creating their own subgenre of the American Western. There is little doubt that in a time when depictions of Canadians were not commonly seen in movies, films with identifiably Canadian Mounties must have been popularly enjoyed by thousands of young Canadians in the first half of the century. Although film production started in Canada as early as 1897, Canadian producers and directors took an early backseat to Hollywood. By 1914, Americans had already made about 100 films in or about Canada, establishing themselves as the largest producer of Canadian culture at the time. They were eager to take advantage of Canada's "exotic" landscape as the backdrop to their melodramas, which gave birth to a series of films called "North Woods Dramas." These films, with names like Flower of the North, The Flame of the Yukon and The Lodge in the Wilderness featured stereotypically Canadian elements including French-Canadian trappers, Native Canadians, lumberjacks, trading posts, and a wide range of dangerous wildlife, from wolves to rabid beavers. Not surprisingly, plots typically revolved around logging camps, forest fires and avalanches. Far from being a byproduct of only American ignorance, North Woods Dramas were also a specialty of many of the Canadian film production companies that appeared throughout the silent era as well. The hero of many of these North Woods Dramas was what Hollywood felt was the very embodiment of everything Canadian, the Royal Canadian Mounted Police officer. Although the Mountie had already earned a revered place in American popular fiction and radio drama, on film they were an impressively authoritative sight with their commanding uniforms and a tradition of honour that an audience immediately recognized. Here was a rugged hero who struggled not only against evil smugglers and Communists, but also against the harsh Canadian elements. Recognizing the Mountie as a novel variation on the g-men, cops and cowboys that usually stood for all that was right and good in low budget films, Hollywood was quick to reshape the melodramatic North Woods Drama into the Mountie film. Pierre Berton's book, Hollywood's Canada: The Americanization of Our National Image (1975) contains an extensive discussion on how the Mountie films ultimately failed both Canada and America by perpetuating false stereotypes about our country. Although Americans were guilty of presenting a skewered image of Canada to Canadians and the rest of the world, the blame does not lie only with Hollywood. Just as Canadians made North Woods Melodramas, they also made Mountie films. Corporal Cameron of the North West Mounted Police (1912) was one of the earliest and most popular Mountie films, and was made by Canadian film entrepreneur Ernest Shipman. Mounties and other elements of North Woods Drama also appear in Shipman's most celebrated film, Back to God's Country. As B-westerns thrived in the 1930s, so did the Mountie films. So much so that Canadian industrial filmmaker Budge Crawley referred to Canadian feature films as "Northerns," since the Mountie films of the 1930s were almost identical to the American Western genre, substituting dusty sheriffs for clean cut RCMP officers. Further blurring the lines was the fact that heroic Mounties were often played by the same matinee stars associated with the Western genre, including Ken Maynard and Tom Mix. Hollywood was simply transplanting traditional western stories into Canadian settings in an attempt to offer their hungry audience a new variation on a genre oversaturated with product. In the 1930s, Britain unknowingly helped perpetuate the Mountie film in an attempt to protect their own films. After recognizing that imported American films were hurting their own struggling film industry, Britain decided to take legislative action. They established a quota system which restricted the number of foreign made films that could be shown in their theatres. To qualify under the British quota, a film had to be produced in the British Empire and the majority of the people working on the film had to be British subjects. Hollywood took advantage of this loose definition of "British" by establishing film companies in Britain and its colonies that fronted for American financial interests. This way, they could maintain their share of the foreign market by making essentially American films locally in these countries. Canada did not follow Britain's lead. Since we were still part of the British empire, our film production in the 1930s was largely shaped by the British quota system, and Hollywood looked north as a convenient spot to make films that would qualify for preferential treatment in Britain. There were 21 low budget quota films made in Canada from 1933 to 1938, which came to be known as "quota quickies." The biggest player in these b-movies was British producer Kenneth Bishop, who put together about 14 of these films in Victoria, British Columbia. Because they were hastily made with minuscule budgets, these films did not do well at the box office. Bishop's films were closer to American noir films than Westerns, but they continued to exploit the Mountie as an icon of law and order and still portrayed Canada in stereotypical ways. Titles included Death Goes North (1938), Secrets of Chinatown (1935), What Price Vengeance? (1936) and Convicted (1938) which is notable today only because it featured a young Rita Hayworth. Not to be outdone, the National Film Board offered up their own interpretation of the RCMP myth in documentaries released throughout the 1940s and 50s, including The Mounties' Crime Lab (1953). Like the title of this film suggests, these shorts did little to enhance the reputation of the Mounties, and focused on investigative procedures and crime fighting technology. Only Budge Crawley's The Musical Ride (1954) showed the Mounties outside of drab office buildings by focusing on the legendary pagentry and horsemanship of the RCMP. American-made Mountie films continued to appear throughout this time, but by 1956, both the Western and his Canadian cousin the Northern were in trouble. The glut of B-western films made over the last 25 years had overstayed their welcome, and big-budget horror and science fiction films were all the rage. This eventually led to bizarre crossovers like Canadian Mounties vs. Atomic Invaders, a spy film which features "typically Canadian" occurrences like reindeer stampedes. A lack of interest at the box office proved that the writers were just as bored with the subject as the audience. Mounties made only occasional appearances after the 1950s in both American and Canadian films including Alberta's own The Naked Flame (1962). Gone, however, were the days when the stoic Mountie could command a title role. As a popular hero, the Mountie was considered a relic. Proving just this, Bill Scott and Jay Ward created 39 four-and-a-half-minute episodes of Dudley Do-Right, an animated parody of North Woods Dramas and Mountie films. These segments of 1961's The Bullwinkle Show satirized the melodramatic conventions of Mountie films through Dudley's over-the-top heroism and virtue. Not until the 1990s did the Mountie regain some footing on the screen. Paul Gross shot to fame in Due South, a mildly popular TV show that appeared in 1994. Just as the Mountie originally brought a new twist to the Western, producers offered up a slight variation on a popular genre by grafting a Canadian element to a formulaic hour-long crime drama. However, Dudley had done damage to the reputation of the redcoats, and as a popular icon the Mountie could no longer be taken seriously. Instead of biting satire however, Due South focused on bland generalities about Canadian and American cultures for it's scattered laughs. Putting the final nail in the coffin was a live action film version of Dudley Do-Right. Brendan Fraser may have had success starring as the live version of another dimwitted Jay Ward character, George of the Jungle, but Dudley Do-Right tanked at the box office by betraying the original humour of the animated series. From the hero of the logging camp to just plain camp, the diminished figure of the Royal Canadian Mounted Police Officer in popular culture today makes it difficult to believe the importance that this Canadian icon once played. Now licensed to Disney by the RCMP, the image of the Mountie will never retain the authoritative clout it once had, but it continues to fascinate as a symbol of Canada. Mountie: Canada's Mightiest Myth, a 1998 NFB documentary and Michael Dawson's 1999 book The Mountie from Dime Novel to Disney, prove that in a country that has few mythical heroes, some still want to believe that the Mounties always get their man.